After arriving in Palau late in the evening there wasn’t much else to do but enjoy the balmy evening overlooking the jungle at the Palau Plantation Resort. Bright and early the next morning we were up for our intro to scuba diving. 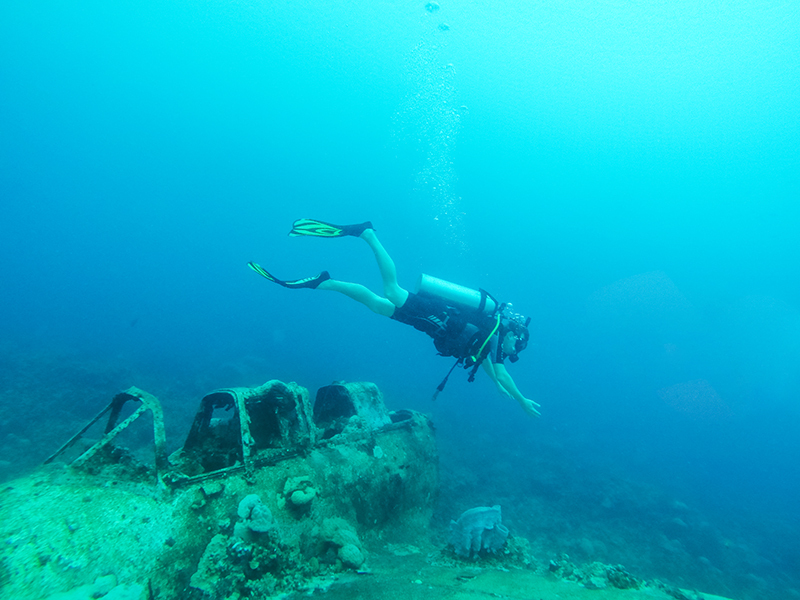 We started off in the harbour at Sam’s Tours, where there were still a lot of exciting sea creatures to see; the famous Palauan cabbage coral, hermit crabs plus loads of fish. 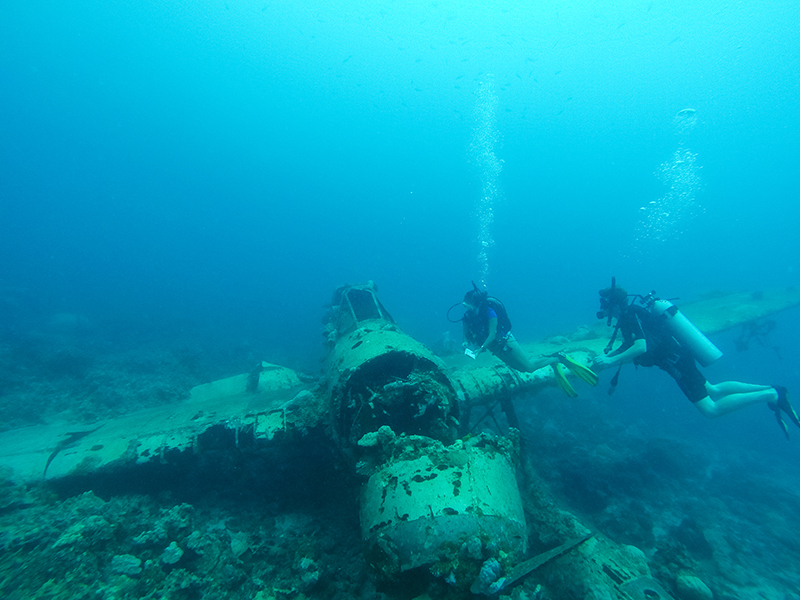 Once we got the hang of the basics our guide and instructor LiLi took us out to the Japanese Jake Seaplane wreck in the rock islands not too far away. 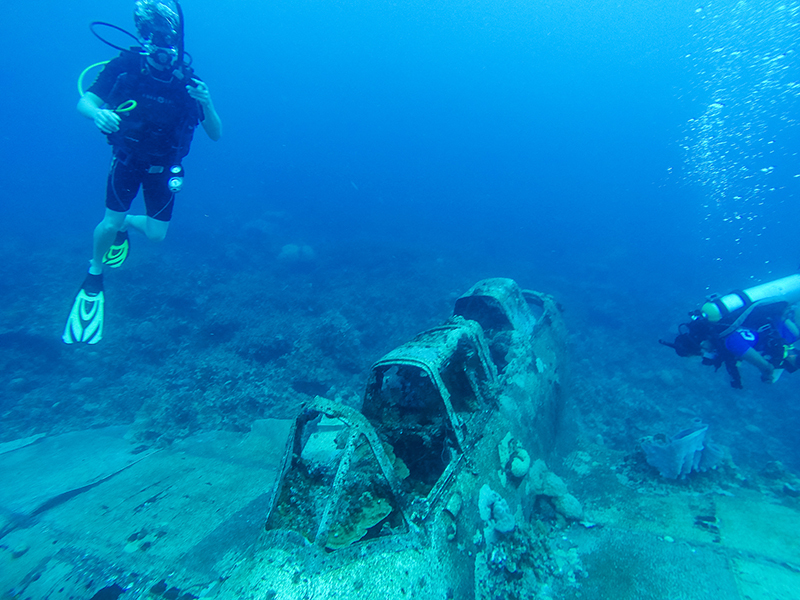 An amazing experience to descend to 45 feet (15 meters) and see an almost intact plane and piece of World War II history sitting on the sea floor that you would never know was there otherwise. Our next adventure was an all day snorkel and Rock Island tour with Fish ‘n Fins. 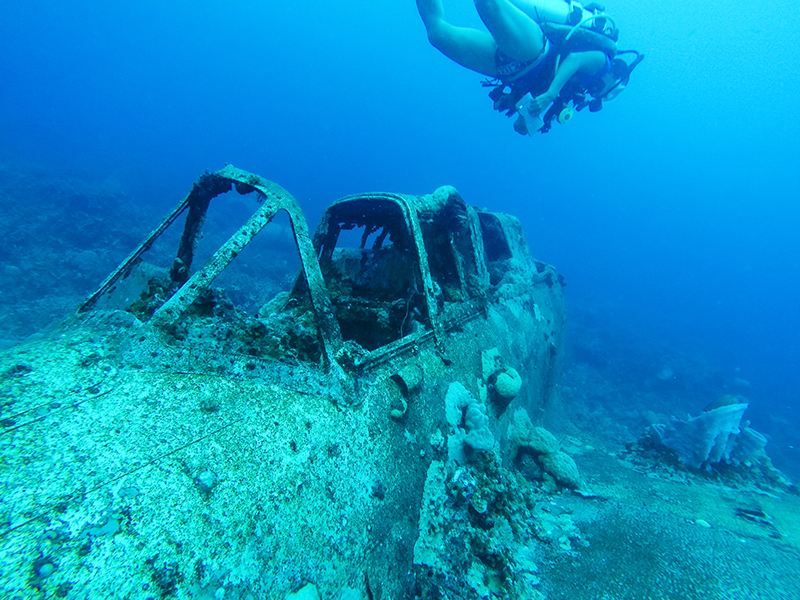 We were with a group of experienced divers who went to dive Blue Corner and Blue Holes, but as we (and a few others) lacked the experience and certification required, we snorkelled off the boat instead. 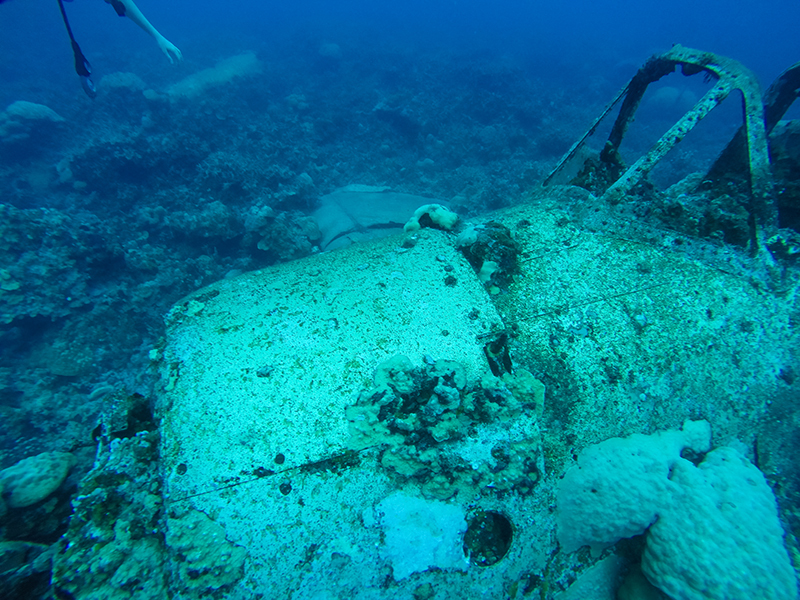 It was here, out on the island’s barrier reef, where saw the whole cast of Finding Nemo, while we watched the divers descend down to 30 meters. Even despite our relative shallow aquatic experience, we still saw sharks large and small, turtles, a Moray Eel lurking in the coral, schools of fish and smaller tropical fish going about their daily chores, it was quite spectacular! The second part of our second day was the Jelly Fish Lake. It was a bit irksome and slimy at first, but they are so sweet swimming and bobbing along, following the sun as it moves around the lake over the course of the day. There were thousands of the little creatures clinging together either for warmth or safety, not to mention the many visitors that came through. It makes you wonder if they notice us swimming amongst them at all. The final stop of the day was the Milky Way, a protected area in the Rock Islands where the sand is actually limestone dust and is so fine that it feels like a smooth mud silt. It is believed to be the fountain of youth and many claim it has restorative properties. But in reality is smells terrible (sulphur) but does feel nice and smooth and is fun to put it all over your body! The following day we went to Dolphins Pacific where we got to get up close and swim with a Dolphin. I have always loved them, they are so graceful and playful, but when you’re close to one to look it in the eye you see how intelligent they really are. Beautiful creatures worth valuing more than just doing tricks. Having said that the song that immediately sprang into my head was “So long and thanks for all the Fish” from the Hitchhikers Guide! When you can look into the eyes of such a graceful and powerful creature your know that the dolphins know what’s up and are definitely smarter than us! Later in the afternoon we went tearing through the jungle at Palau Adventure Park on the zip-line – lots of fun even if it was brief! The ziplines were arranged in four stages, from short and slow to long and blindingly fast, through the jungle down to the river where we jumped on a boat for a cruise (at first!) and then very fast mangrove river tour with some locals. The quiet but confident ‘Palauan Steven Irwin’ to look for crocodiles on his small boat, but with a 200 horse-power outboard motor it was more fast and fun than slow and contemplative! The next day was a day specifically organised for Garth but one that I also enjoyed because he was having so much fun! 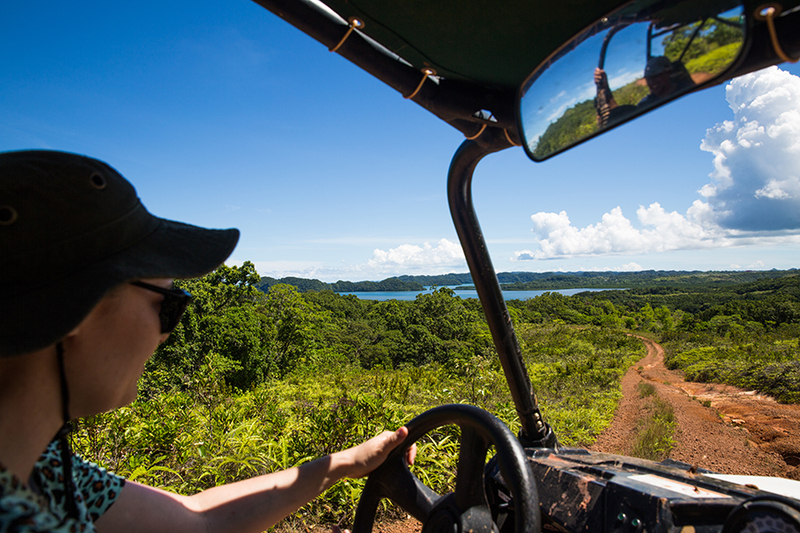 – the ATV Off-road Jungle tour with our Fish ‘n Fins guide Kent. An incredibly knowledgable local Palauan man, who had spent most of his life before becoming a tour operator as a subsistence fisherman. We could have talked with Kent about the history of humanity for hours, but he is also a bit of a reckless thrill seeker so if was into the ATV and back into the action! 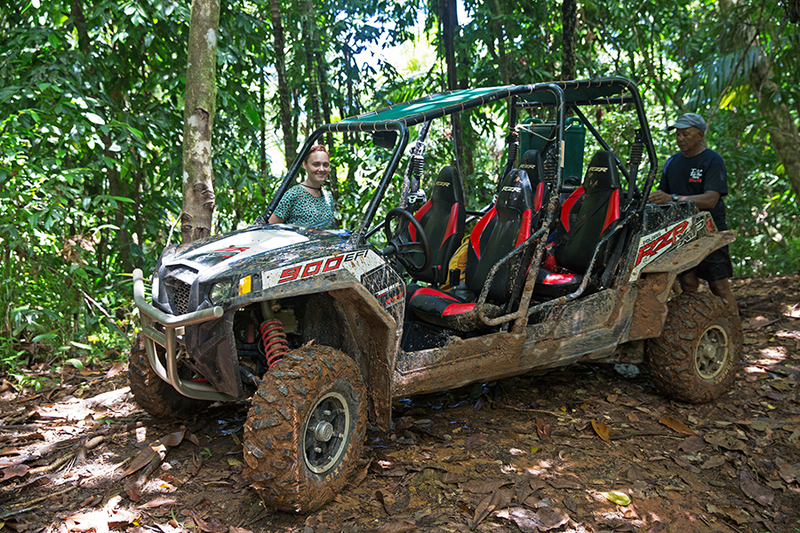 Secretly I think he likes to get muddy and thrown around in the ATV by tourists in the jungle! A super fun day learning about the history of Palau and its natural ‘supermarket’ of life while tearing through muddy tracks in the jungle at high speed and ending up at a beautiful waterfall for lunch and a swim. Our final day was a ‘chill out’ day which we spent at the Palau Pacific Resort. It’s the only hotel in Palau with a beach and it’s a great beach too; calm and full of fish and corals to snorkel and swim. We ended our day and holiday with Piña Coladas and a beautiful orange sunset over the water. Palau is incredible! Warm (even when it’s raining), beautiful and kind locals who are always happy to help and informative guides only too happy to impart their knowledge and promote their wonderful history and culture. It truly is a paradise.